“This is the wrong form. I can’t accept this,” says the guy at the boarding gate desk at Pearson Airport in Toronto, after scrutinizing the reciprocity visa form I had just passed to him. I think the first thing that popped into my mind was why the heck didn’t I heed the little voice inside which said to me when I was applying for this visa to Argentina, “Is this all there is?” Somewhere in the process of filling out my information I thought I recalled that there was the word ‘forms’ and not the singular, but I could only find the one I had in my hand so this had to be it. At the time, I did think this rather odd but didn’t dwell on it as more pressing issues took over. “We need the authorization number so go over to the Customer Service desk to get the proper form printed off,” he replies. “If you hurry, you can make it.” By now I am beginning to feel the first pangs of panic and my voice probably reflected that as I realized I hadn’t a clue where that desk was or how to find that missing form even if I did know where it was. He tells me that if I take a short cut through the Duty Free shop and hurry that I can probably make it back in time for my flight. Probably! He doesn’t seem too concerned so I think perhaps this has happened to others. In fact while I was waiting at the gate in good time to board my plane, many reminders were given to us, the passengers, that this reciprocity visa was required. Obviously many of them weren’t even aware of this so I felt pretty smug that at least I had mine. Little did I know! I start to run through the throng of people still waiting to board, telling myself to stay calm and that this will turn out all right. The plane just can’t go without me. I see the desk not too far away but also see that all three reps are busy with customers. I presume they are the unfortunate ones who have missed their connections due to the icy weather conditions in Toronto which had already delayed my flight from Ottawa by two hours. They don’t seem to be in as much of a panic as I am so I bravely announce that I need help right away with printing out my visa form for my flight which is just about to take off for BA. One of the girls picks up on the urgency of my situation long enough to tell me to grab the nearest computer, go into my account and bring up the form. By now my mind is drawing a big blank. What account? After a deep breath, some common sense finally clicks in. I try to get into my g-mail account but the computer isn’t co-operating. I ask the girl for help but she replies that she isn’t very computer savvy. Excuse me but am I hearing her correctly? Finally, a young fellow appears who is obviously aware of my panic and inability to function properly so steps in to help. He manages to calm me down and together we find the account which by then I remember setting up to get the form(s). Behold, there is the elusive second form which I had missed when I applied several days ago. It was way down the page and hardly visible as far as I could tell. No wonder I missed it! He quickly ran it off and after a hasty heartfelt ‘thank you’ (if I had the time I would have given him a hug) I ran for my gate via the Duty Free. By now I’m convinced that more than a few minutes have passed and that the plane has probably taken off. Then I hear my name being called and realize they’re waiting for me! The Duty Free staff are now aware of what’s going on so all come to my rescue pointing me in the right direction to my gate. God bless them all! The area is totally deserted as I approach. All the passengers are on board. I race down the ramp. Please don’t close those doors I silently pray. Instead the crew greet me as though all is normal and calmly direct me to my seat. Such an overwhelming feeling of relief washes over me. I quickly give thanks to all seen and unseen beings who have helped to finally get me on my way. The rest of my flight was totally stress free. They fed me lots of food, I watched a couple of movies, and even got some much-needed sleep. The next morning I woke up to the captain announcing that those of us on the left side of the aircraft should raise the blinds and take a peek at the view of the Andes below us. 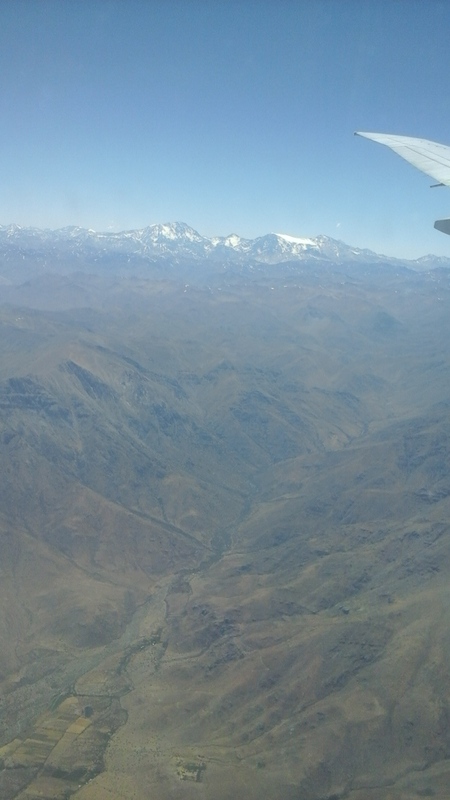 We were making a quick stop in Santiago, Chili, and there below us were miles and miles of brown mountains iced with a smattering of snow on its chain of peaks. What a wonderful introduction to South America! 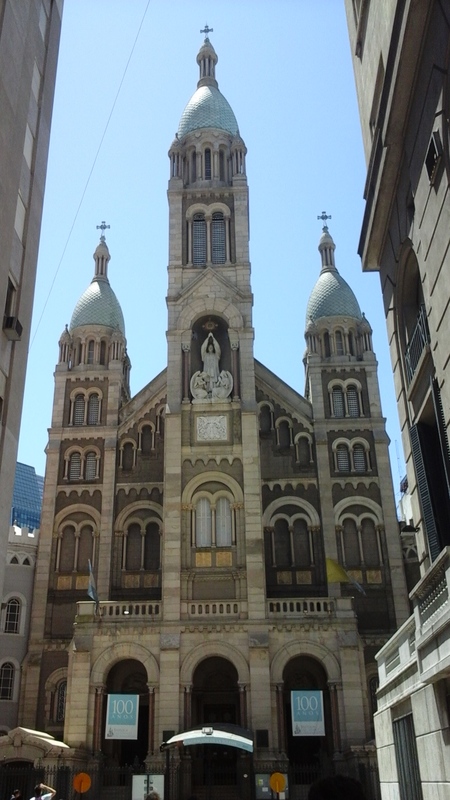 As I write this, I am exactly into the fourth day of my visit to Buenos Aires. In some sense, I feel as though I am in another world way down below but as I get more settled this sophisticated city seems no different from any other European city especially Paris. I understand now why it’s called ‘the Paris of South America’. I should also mention that not only does it look like Paris but it’s almost as expensive. Bring some American dollars to tide you over until you can find a bank that takes your bank card. My friends and I found out that many banks won’t accept them. So far a bank displaying a big red ‘B’ near the door is the best bet. Money changers, which are now legal in Argentina, like American dollars and Euros but wouldn’t even consider my Canadian money. This is true for right now but in Argentina such things as economy and money can change on a dime. The cheapest and best way to get from the International Airport to the city centre (about 45km away) is by bus and taxi. The company I used was TiendaLeon located right at the arrivals door. For $15US the bus took me along the main highway to somewhere on the outskirts of the city. From there I was transferred to a mini van taxi which brought me right to the place I am staying in Palermo. They were all efficient and courteous. If I had taken one of the many taxis that were lined up I would have paid $40. Bring a good pair of walking shoes, or sandals preferably at this time of the year which is their summer. The city is huge (like Paris) and is divided up into many areas. Palermo where I am staying is further sub-divided into its sections i.e. Viejo, Soho, Hollywood,. There is a subway system which unfortunately doesn’t cover the whole city and buses to go where the subway doesn’t. I have been relying mostly on my feet to take me to where I need to go. I can see more that way. Unfortunately, my lousy sense of direction has caused me many additional steps. However, I do find that motorists are fairly courteous and seem to obey all the traffic signs. It’s certainly a big improvement over the SE Asian cities I’ve visited. If you want to learn more about the city BA has a great deal in their FREE Walking Tours – one in the morning and one in the afternoon both to different parts of the central part of the city. They are available every day come rain or shine. My friends and I took the morning one on our second day here and found it very helpful in learning BA’s past and present. It’s a good way to orient yourself to such a huge city which can be overwhelming at first. It also helps to know some Spanish. I have found a course on-line, called Memrise, which is helping me a bit for the everyday words one needs but it’s not enough. Many Argentinians know a little English so we manage. However, I have noticed that signs and menus are almost always in Spanish. Thank goodness many Spanish words are similar to our English words. Apparently Argentinians speak a lot like the Italians so my husband who can speak Italian should find it easy to get around when he arrives in March. Finally, Argentinians like to think in terms of ‘big’. Our walking tour guide took us to Avenue de Julio which they claim is the widest avenue in the world. In fact, he said that Argentinians like to think they have the biggest and best of many things in the world like steaks and soccer. Probably the best part of my days here so far is waking up each day to the sun. Was it less than a week ago I was slogging around in the ice and snow in Ottawa? My first day here was overcast at about 28 degrees but the last three have been sunny with clear blue skies and temperatures hovering at 30 to 32 degrees. Yes, it’s hot but not unbearably so as there is little humidity and some soft breezes. 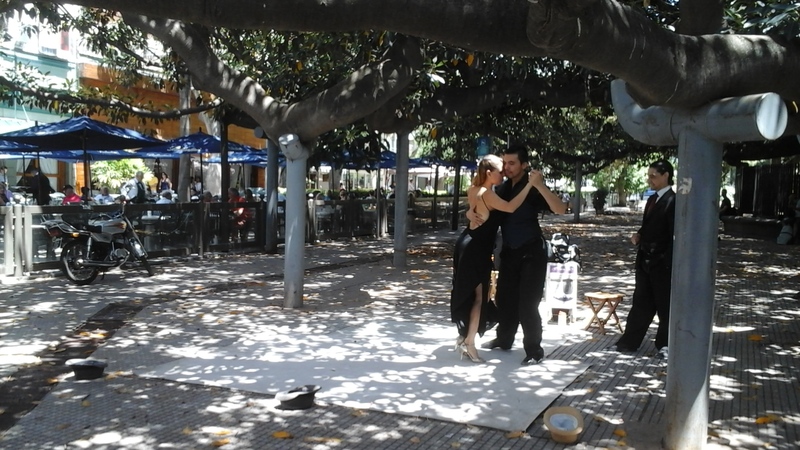 Today I stayed close to Casa Aire Palermo where I am staying to give my aching feet a rest. This bed and breakfast is owned and run by a young couple with an adorable one year old son who smiles all the time. It’s an older home with about five rooms which they let out and comes with a common kitchen and living area for the guests’ use. To keep within my budget I have been limiting my meals out and taking advantage of their kitchen. Immediately outside my room I have access to a small garden where I can sit at any time of the day. You can find this great place on booking.com my favourite site for locating great places to stay around the world. They have never let me down. As I look back over this week, I am still coming to grips with how it could have taken a turn for the worse when I was beginning my journey at the airport in Toronto. I would have liked to have handled the situation without losing my cool and almost having a panic attack, but luckily for me it was the beginning of a trip which so far has exceeded any expectations I might have had. I am just so thankful to be here learning about a new culture, meeting up with old friends from Dubuque, Iowa whom I met seven years ago in Bangkok, and enjoying the warmth of the sun. Life is indeed good! 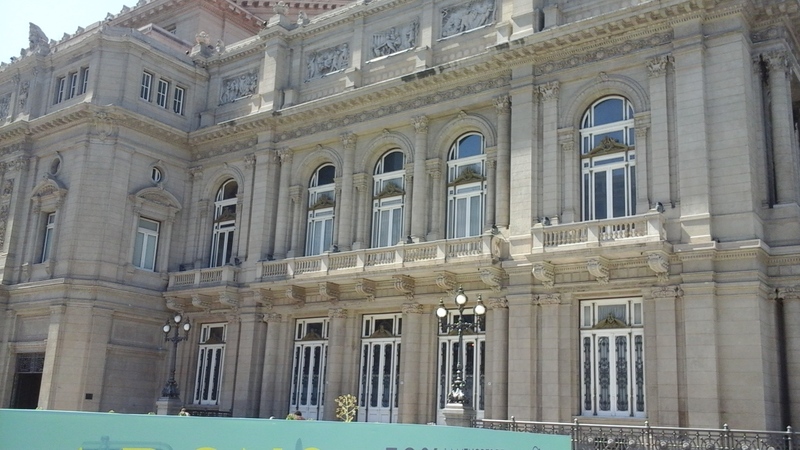 The Theatre Colon opera hall. 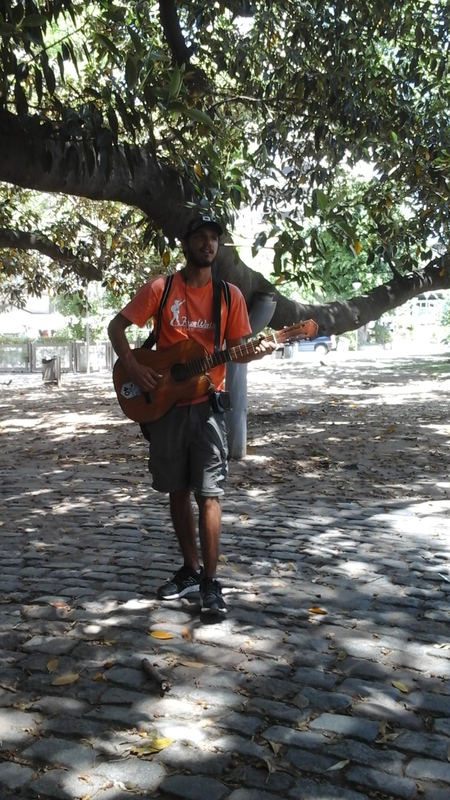 Our tour guide displaying his skills at guitar playing and singing.